"There is magic between the covers of a coloring book, a type of magic that can take us away and walk us into a million worlds. Further, coloring books make artists of us all, whether we decide to be Rembrandt with his realistic colors and patterns, or Picasso with his odd cubist designs and surreal colors. 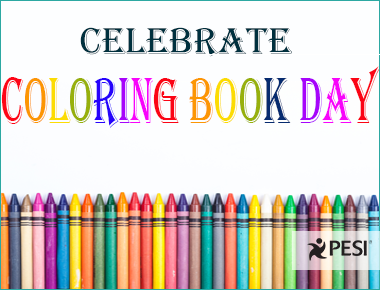 Coloring Book Day encourages us to get back to the days of our youth, and dive between the pages of a coloring book." according to Coloring Book Day. That's right, adults can color too! Coloring books have been used for everything from educational purposes to aiding in therapy and health. According to Truly Mindful Coloring, this is because we live in a world often filled with words, spending much of our time thinking about things, and taking in the array of auditory and visual stimuli that fill our senses with never-ending input. Imagine taking a big breath, pausing, and finding a way of being that offers a complementary approach to our lives. We can imagine that the part of the brain involved in linguistic processes, rational thinking, and even the intake of sensory stimuli are balanced in a helpful way by taking a pause in your life to let words go, release the rational processing that dominates your life, and enables the directionality of living to transition from reception to expression. With these marvelous figures, you can use your hand-eye coordination to lay down whatever color schemes arise in your imagination, giving yourself permission to let impulse and intuitive sensations arise and guide your eyes and hands. Many opportunities exist in the pages of a coloring book: self-reflection, gaining insight, becoming more internally grounded, and healing through self-expression and self-examination. Each person will interact with coloring differently and that's part of the fun! Gather your crayons and colored pencils and start coloring! There are hundreds of coloring books for children of all ages out there, and you can certainly find one or more that suits you. While you're at it stock up on new coloring supplies, and start looking for those adult coloring books like Stay Mindful & Color, Truly Mindful Coloring, and the Mindful Doodle Book. Or check out these children's books including The Mindfulness Skills or Yoga & Mindfulness Practices for Children.